During Surrey Art Gallery's 2018 Connecting Threads exhibition, a 17x10' wall and 20' walkway are transformed into Bearing Witness, two massive looms where the public is invited to consider Bear Creek Park, home to one of Surrey's few remaining alluvial forests. 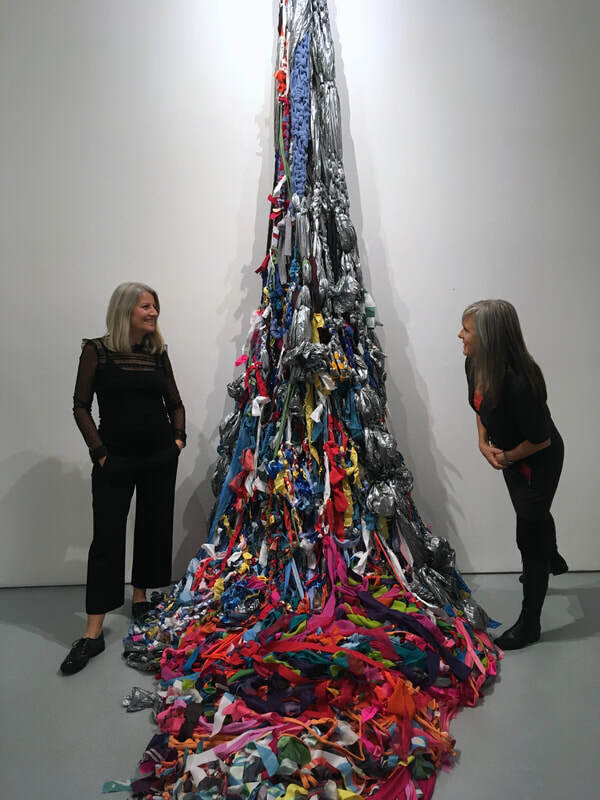 During the course of this exhibition approximately 400 contributors tied, knotted, braided, or wove upcycled and recycled materials into fungal forms, berries, creatures, salmon roe, forest or water. "Alluvial forests, like Bear Creek Park, are fed by the nutrients of its water source including the remains of spawning salmon. These forest ecosystems get their name from the nutrient-rich "alluvium" (silt, sand, clay and gravel) that is deposited when streams or rivers overflow their banks. Honouring these few remaining forests, artists Roxanne Charles and Debbie Westergaard Tuepah invited the public into Bearing Witness, a touchable fibre forest, to experience and contribute to its vitality. Bearing Witness celebrates the value in people coming together to bring about positive change, both in this place and our environment at large. In the same way that everything in a forest is interdependent, so too is our experience and witness of this participatory installation, where no offering is too small. " In the midst of Canada's 150th year anniversary Unwhitewashed interrogates P'qauls, the "white rock of White Rock Beach" in the context of the lands and culture that is the White Rock of today, as contrasted to it's expansive history as home to indigenous peoples for more than 10,000 years. Led by artist Roxanne Charles of the Semiahmoo Nation in collaboration with Debbie Westergaard Tuepah, a first generation Canadian of Danish descent, this work symbolically gives voice to oral and written histories of the Semiahmoo people. Unwhitewashed seeks to generate dialogue and understanding relating to land rights and concepts of place, the current realities of ownership over the rock itself, and issues ranging from the Semiahmoo people's rights to drinking water through to modes of self-recognition as they relate to truth and reconciliation. ​Embodying great historical and current significance to the Semiahmoo people, the rock has, over time, become an iconic 'whitewashed' landmark on today's White Rock beach. The Network, an ongoing public participation project has been included in multiple venues with hundreds of people contributing the sculpture’s growth. 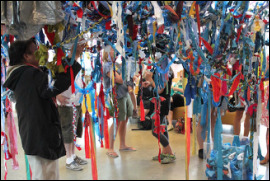 Created from coloured strands of synthetic waste materials like plastic and polyester, The Network is a public-engagement-driven, in-progress 3 dimensional work that operates as both an opportunity for and visual representation of actual social interaction. Resembling something between free-form macramé sculpture and an electronic conduit system this work can be viewed as a symbol of the often fragmented, unpredictable nature of open dialogue, with ‘threads’ of conversation joining into other tangents, tangling into dead-end knots or left dangling like a sentence fragment. The first strands of The Network came together in 2011, borne out of the general belief that there is no substitute for physical social interaction, and that when the hands are busy in rote activity, conversation flows. As with dialogue or the world wide web, this project has no logical end but contains the inherent possibility of infinite growth and complexity, as lines are woven into area and volume. The no-barriers fabrication method — simply knotting one strand to another — allows anyone to join the conversation by simply tying one on, creating an opportunity for people of different subgroups to participate in a shared activity in the same physical space. Artists Carlyn Yandle and Debbie Tuepah perform the role of IT support: retying loose ends or securing lines of communication, all while retaining the integrity of each user’s activity. The Network was profiled in Leanne Prain’s book, “Strange Material: Storytelling Through Textiles”.